Subject: Warhammer Underworlds - Mollog's Mob rules preview, Pre-order with Godsworn Hunt this week! I like to think of the new names as that species’ name for itself and the old name as the common Imperial citizens name for them (or in the case of Imperial names, the High Gothic name and the vernacular). Funny enough reading up on a spoiler review of realmslayer Gotrek ask's a certain character about the name changes and the in lore reason for the name changes. Snorii tells Gotrek that people called them dwarfs and they simply ran with it since it was easier. So dwarfs or dawi wasn't the actual name for their race. Now mind you I haven't listened to the audio drama but this review was done by a huge dwarf fan who enjoyed it. I mean hell High elves and Dark elves don't call themselves elves. They refer to each other as Asur or Druchii. Craftworld eldar in 40k also call themselves the Asuryani. Or now they do, at least. Anyway, I was never very impressed by the Godsworn Hunt minis, but now getting a closer (and 360) view of them on the GW website, they're actually quite nice. Not such a fan of the spear chick or the bow dude, but the rest of them are very cool. I you couldn't tell she was female from the first time the model whas shown I don't know what to tell you. Yeah no kidding. The artwork of her is pretty awful IMO, but the miniature is 100% female. Leader could've use a more creative pose other than showing her palm with the eye just like the Tzeentch warband leader. And a better hair, that didn't look like her barber have an accident. Really looks like the Godsworn Oath are the point where the GW rules designers show that they are getting to grips with the system. Those Oath Objectives are brilliant! Allow for a lot of mind games, show reveal an Oath, while keeping the others hidden. Aim to score the ones that you didn't reveal, all the while the opponent may try to counter an objectie you aren't doing. Really shakes up the game. I preordered both of the new Warbands, so can't wait to get my hands on them! The Hunt’s leader Theddra Skull-scryer is a level 1 wizard. However, Theddra Inspired is a level 2 wizard. Can I apply Arcane Savant to Theddra Skull-scryer and will it fall off immediately if I do? I think the answers are “yes” and “probably not” but I don’t know for sure. Yes and no are apparently the answers from a GW game play video or something similar. You put it on her at level 1 and it makes her a level 2. Then she goes to level 3 for inspiring. You cannot equip it if she has already inspired. So yes, it can make her a level 3. Check out my Deadzone/40k/necromunda blog here! Subject: Warhammer Underworlds - Built pics of Mollog’s Mob! Preorder on the 26th? Blame GW for losing the Chapterhouse suit. I'd rather blame them for believing that the new idiot names shield them against a repeat of that. I struggle with two cards. Maybe one of you is so kind to explain me the difference between the upgrade "Regeneration" (At the beginning of each action phase, remove up to one wound token from this fighter) and the upgrade "Regenerate" ( At the beginning of each round, remove up to one wound token from this fighters fighter card). Where is the actual difference between "action phase" and "each round"
There isn’t, and you can have both. Yeah there are a few cards like that, with different names but fundamentally identical rules; they allow you to work around the “no more than one” rule and it’s quite deliberate. Subject: Re:Warhammer Underworlds - Mollog's Mob rules preview, Pre-order with Godsworn Hunt this week! Haven't seen these posted yet but I got the 2nd quarter Underworlds Organised Play pack a couple of weeks back no. This time it's Zargabs Gits and Eyes of the Nine that get the treatment. Also...that's not Mollog's Mob or the Godsworn Hunt. It's the Eyes of the Nine(the Tzeentch warband) and Zarbag's Gits. Got my hands on the Godsworn hunt and the sculpts are event better in person. Ylthari’s Guardians encapsulate the mercurial beauty of the Sylvaneth. 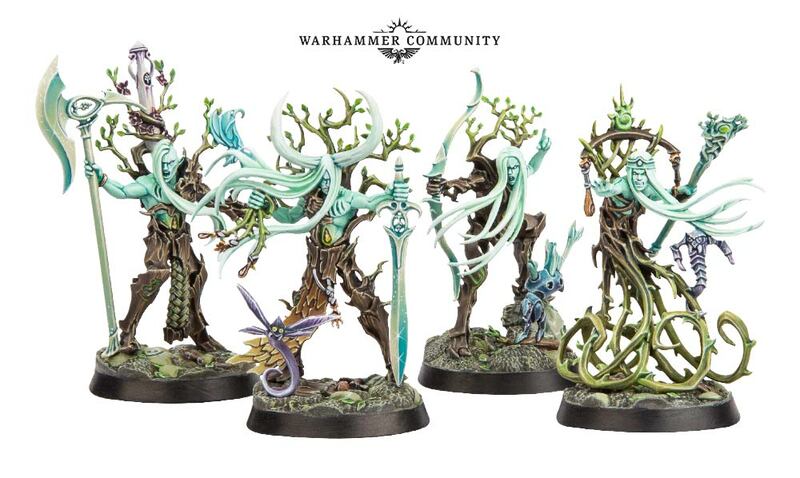 Based on the Spite-Revenants and Tree-Revenants, these mystical guardians feature design elements from across the entire Sylvaneth range, making for a characterful group. But that’s not all they are…Ylthari’s Guardians feature a distinct play style that takes everything you love about the Sylvaneth – durability, flexibility and magical power – and translates it perfectly into the intense, competitive scale offered by Warhammer Underworlds. If you’re looking to turn over a new leaf and fancy branching* out into a new warband, this is the one for you! I hope they play more varied than they look. Look very good, from the trailer. Octopus spellcasting lady could've used a more creative pose. Wonder, if they'll have a respawn ability? Interesting how they all have little critters on their bases, perhaps an alternative attack to their profile? Similar to how Farstriders have an attack with a bird. Don't mind the stiff poses, but the wizard does feel a bit uninspired. To be honest the art what much , much better than the models, specially the faces... what happened to that... priestess? the one with the tiara. Those are some incredible easy-to-build figures! Great colour scheme - though I reckon they'll be some stunning paint jobs floating around soon. I wonder what they mean by new playstyle? I know. I mean what happened to her face. Wow. How uninspired. Apart from maybe the caster, these could be metal models. What’s exciting to me about the medium and new tech is the potential for dynamism. Swing and a miss here. I really like the new Sylvaneth. Definitely buying them. I was expecting their leader to be a "real" person and not a tree spirit. Um...yeah, that's kind of the whole thing with Sylvaneth? They're not so much "undead elf spirits" as they are Alarielle's "portion" of the Aelf souls recovered from Slaanesh. Like how Morathi made the Khinerai and Melusai, she's made the Tree-Revenants. well, I have not been deep into WHFB Elves since way back when, so I had been thinking that Sylvaneth was "GW-speak" to protect copyright etc.. I did not realize the design was as divergent as this. My own fault, I guess, of asking before researching. Those are kinda a letdown IMO. I think if the hair weren't so overdone they'd be better. (And a more contrasty paint scheme between the skin and hair color would help too).